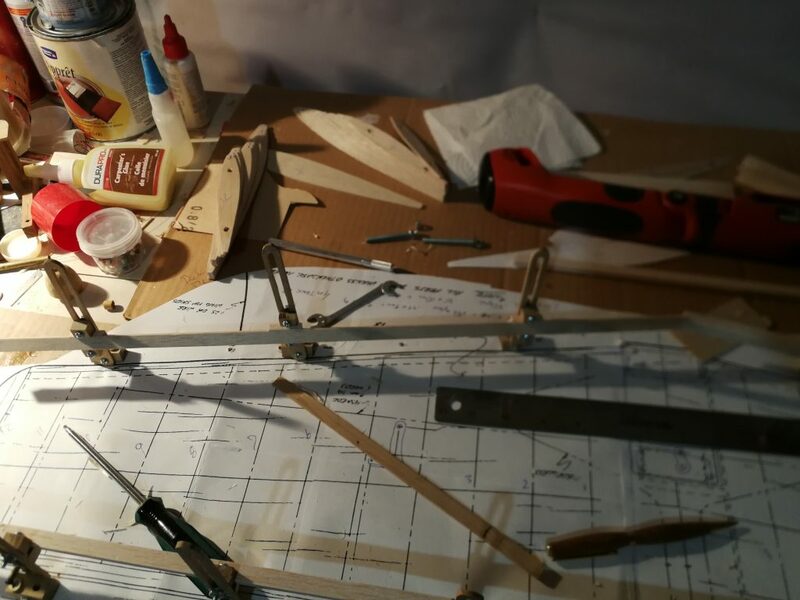 Wing Jig-its are a tool for supporting the construction of model airplane wings on any number of surfaces. 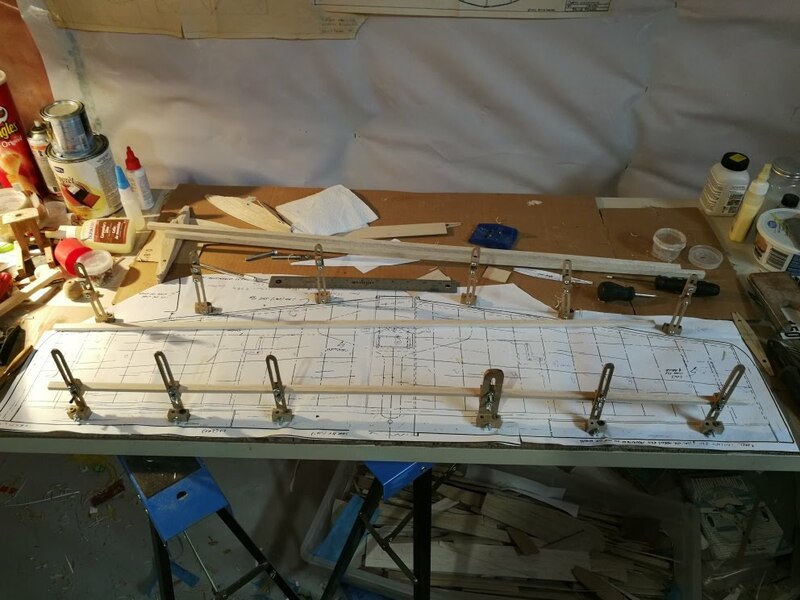 It is used as a wing leveling system. 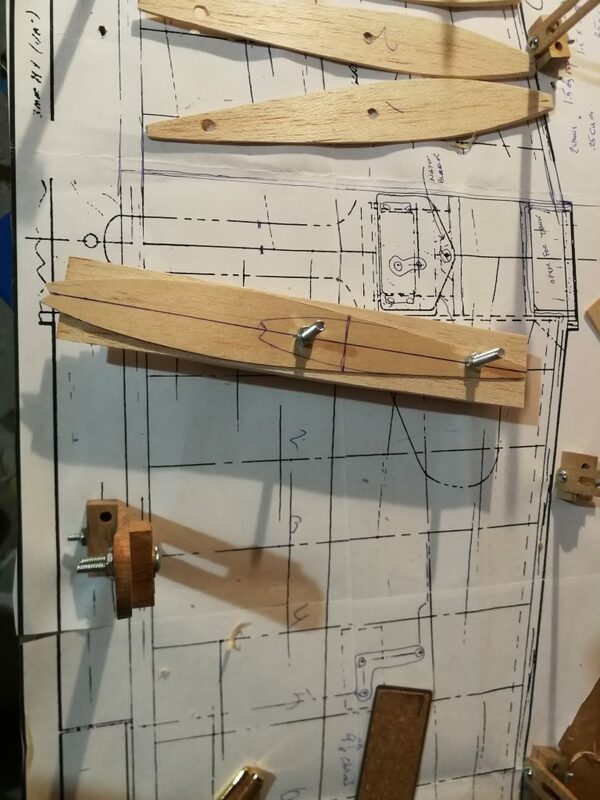 This system has been proven and comes from the early 1920’s when wood wings were the method of the day. 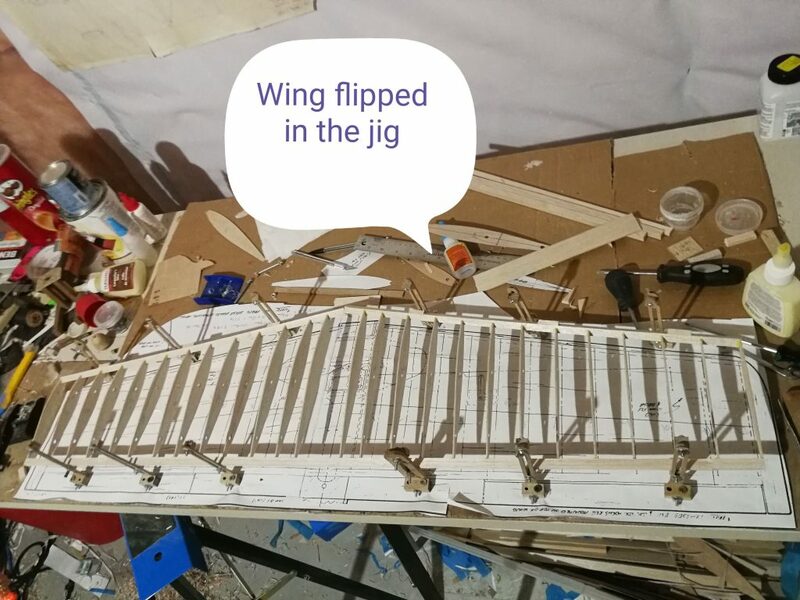 The single Jig-it is use in combination with others as a system to support wings while they are being built. 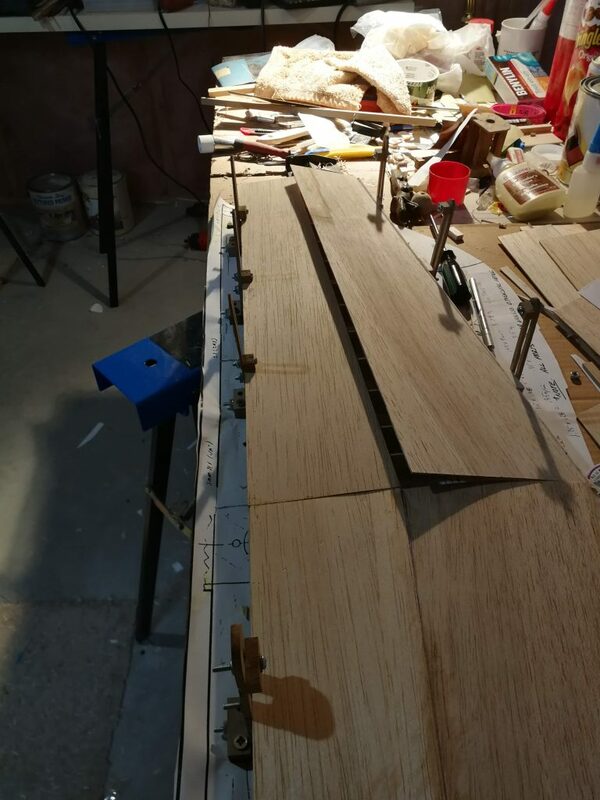 Each Jig-it is made from durable material, traditionally aluminum but in my case I chose Maple. 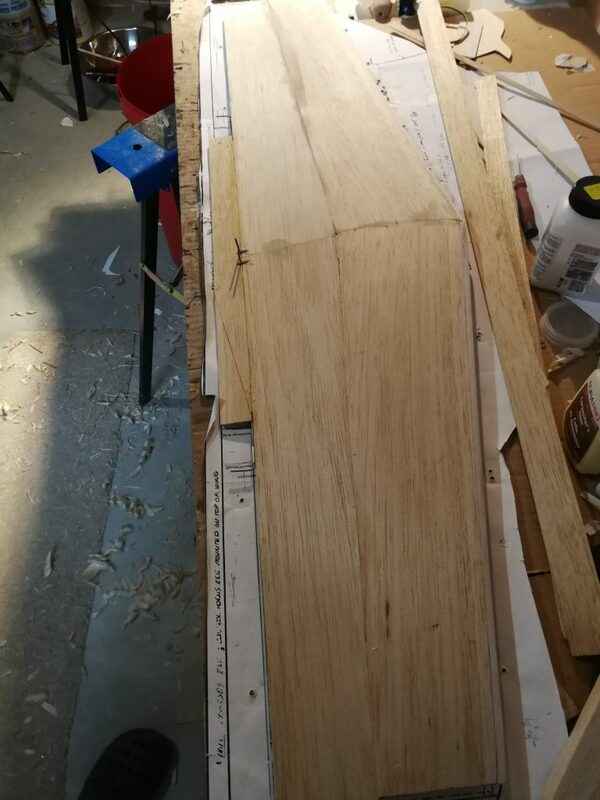 Maple is solid, without cracks, has the consistency of a plastic, and can be worked with hand tools and can be finished with your favorite varnish. 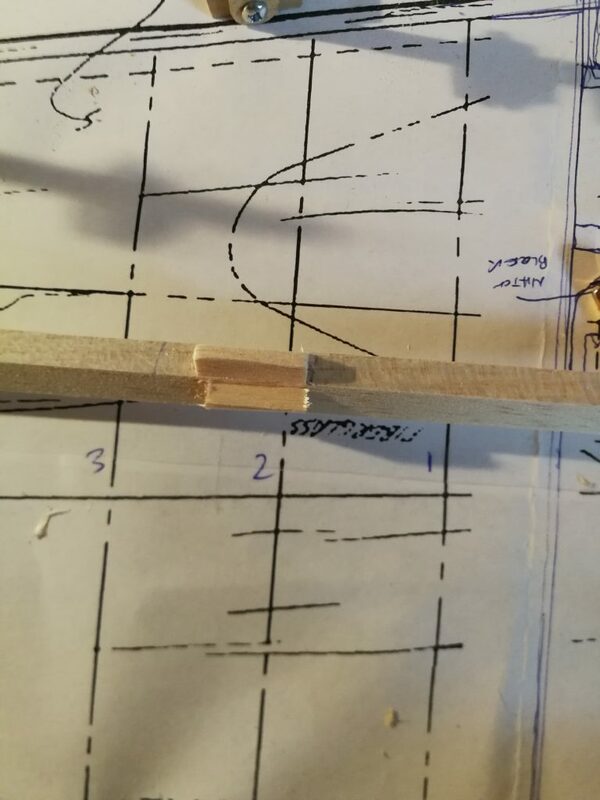 Jig-Its are attached over the plan, on the perimeter of the plan so that the guide blocks are just inside the edge of the plan. 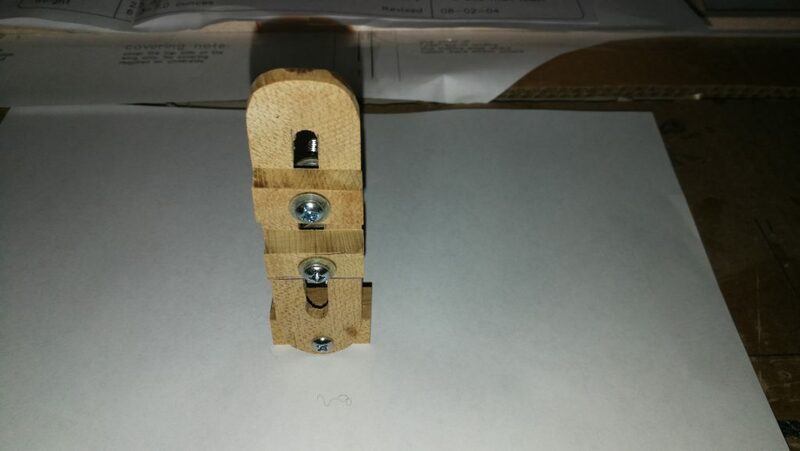 In this example they are attached to the work surface with a typical drywall screw and can be removed and re-positioned if required. 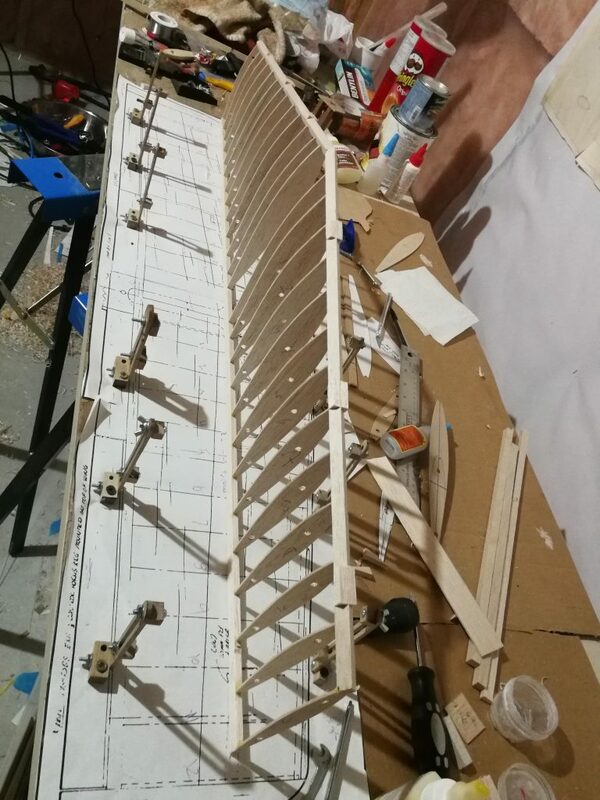 This wing is 42 inch span and I felt that 4 per panel was not quite enough. I added a few more to make 6 per panel. 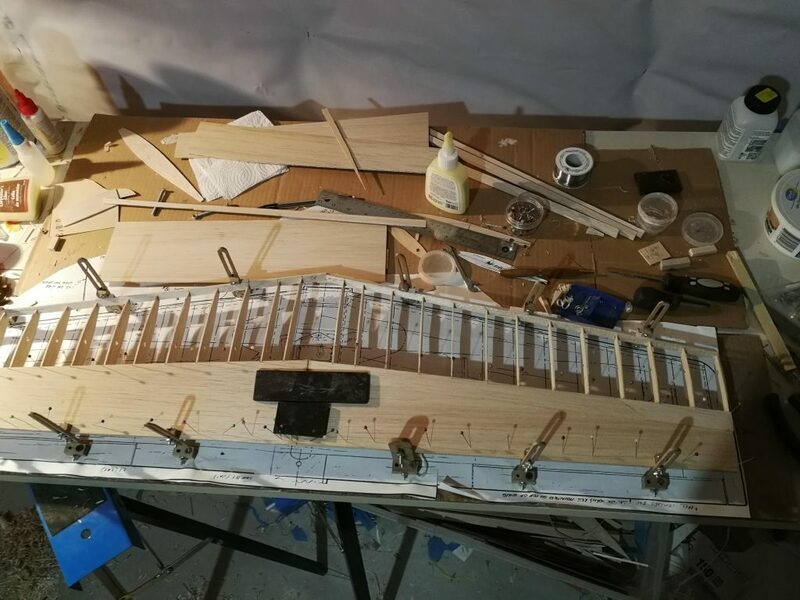 In the initial stages, I created the leading and trailing edges and prepared to install them in the guide blocks tightened by hand. 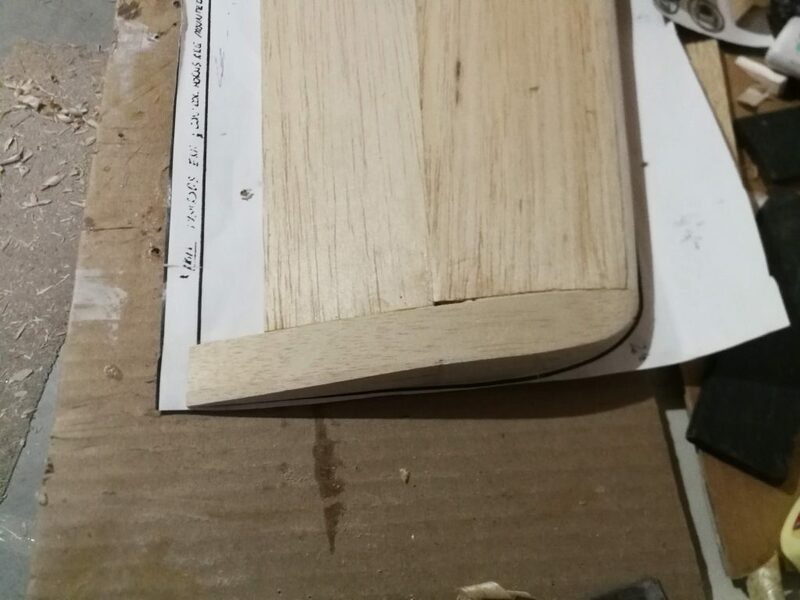 The Trailing edge did not need any prep, it jigged in easily. The leading edge is a diamond and is attached to each rib on edge. I had to add some triangle stock to make some landing pads for the guide blocks. 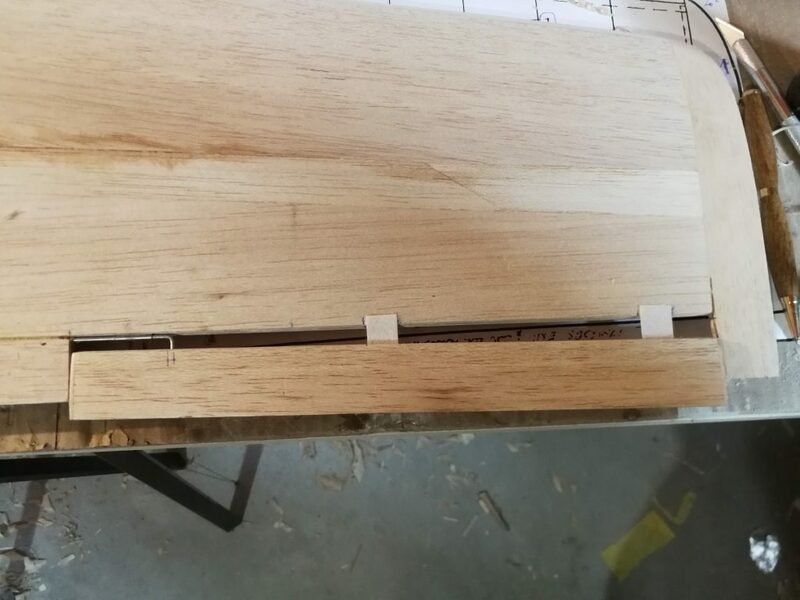 This is only for the leading edge if the leading edge is installed into ribs on edge. Once these spars are jigged up they can be leveled. 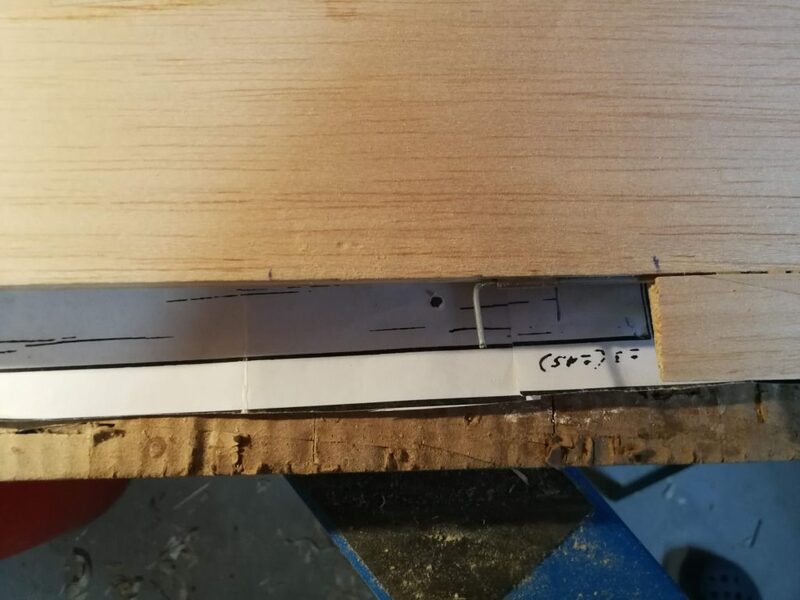 Initially they are raised up by the use of a straight edge ruler measured from the plan work surface. Then they are leveled by a sight level at each jug station and between. 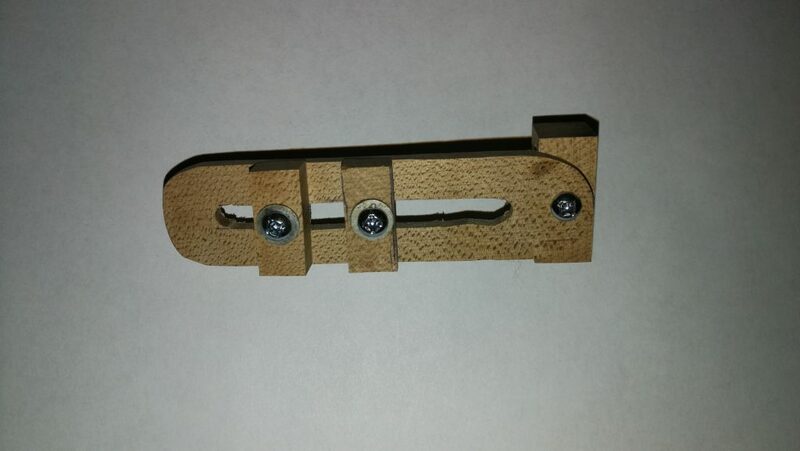 I used the Level App on my smartphone and it worked but a good small mechanical pen sized sight level will also work. I got the reference for my App level zeroed or calibrated by placing it on the concrete floor and making it zero set. Then I used the level app and raised and lowered each spar to a couple a 10th’s of a degree on the level. 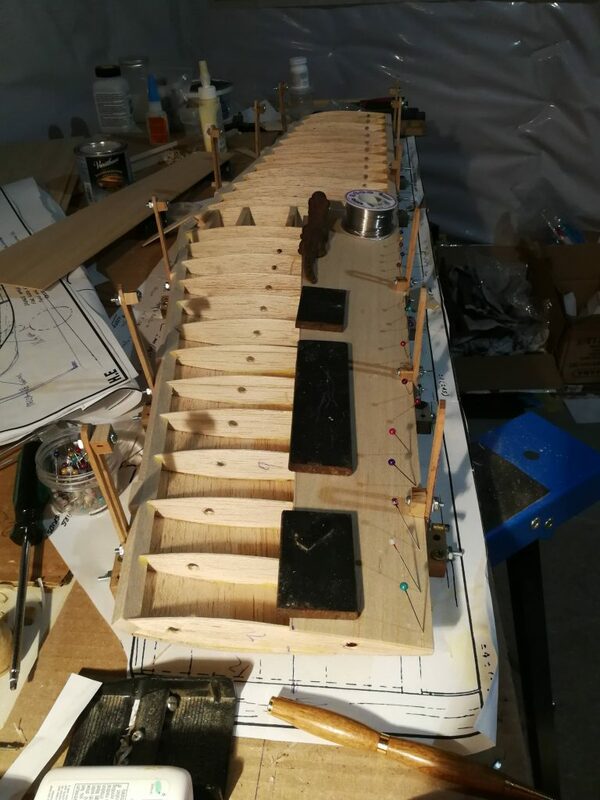 I had to lower the leading edge slightly as it was high but measured is on the spars center line all around so that the leading and trailing edge center lines were all at the same measurement. 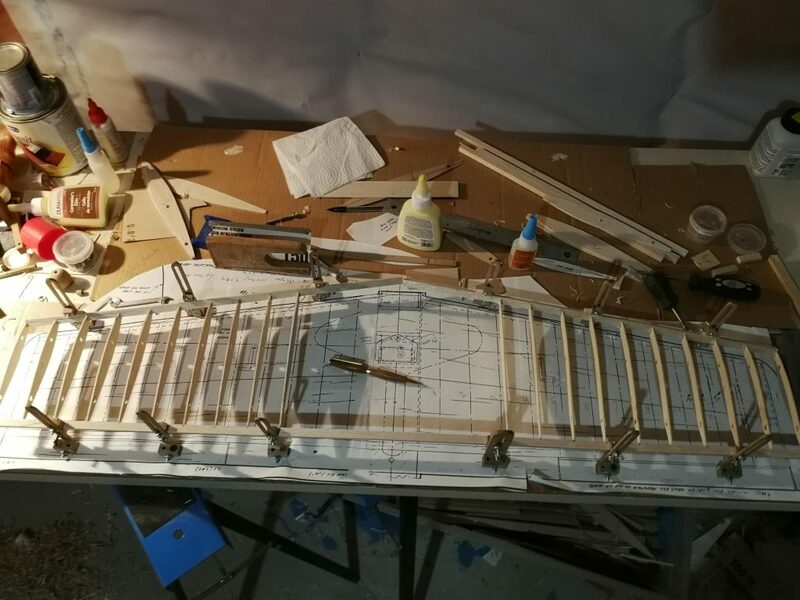 At this stage our wing is ready for rib construction and installation. 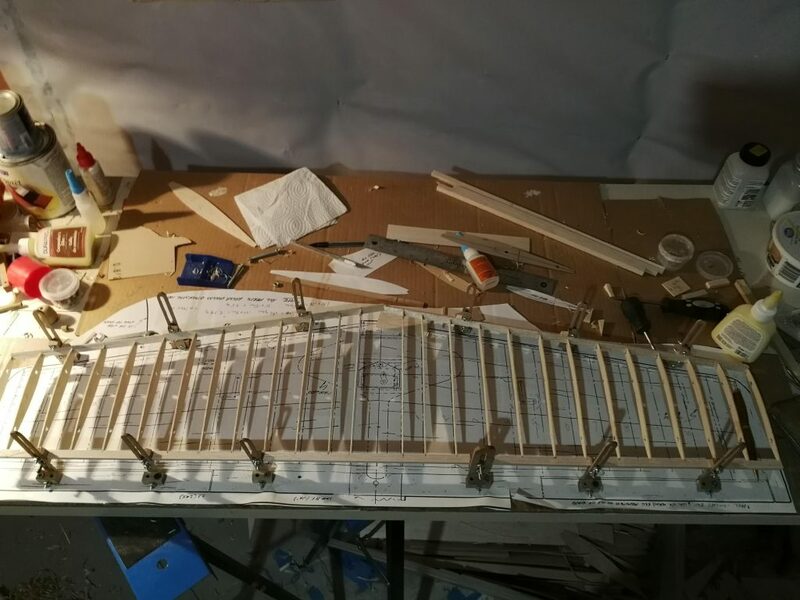 Ribs are made in any fashion that suits your building style. 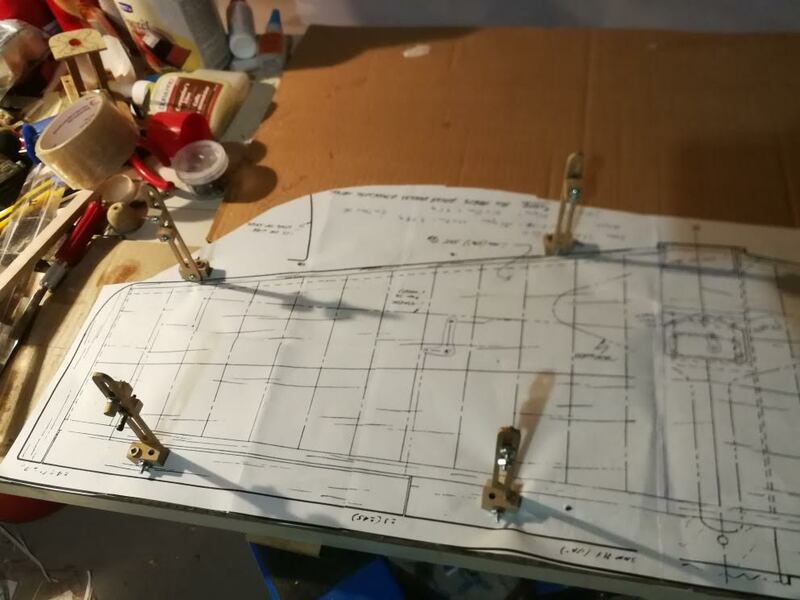 Some designs are not so simple and cutting out each rib by hand is the only way. 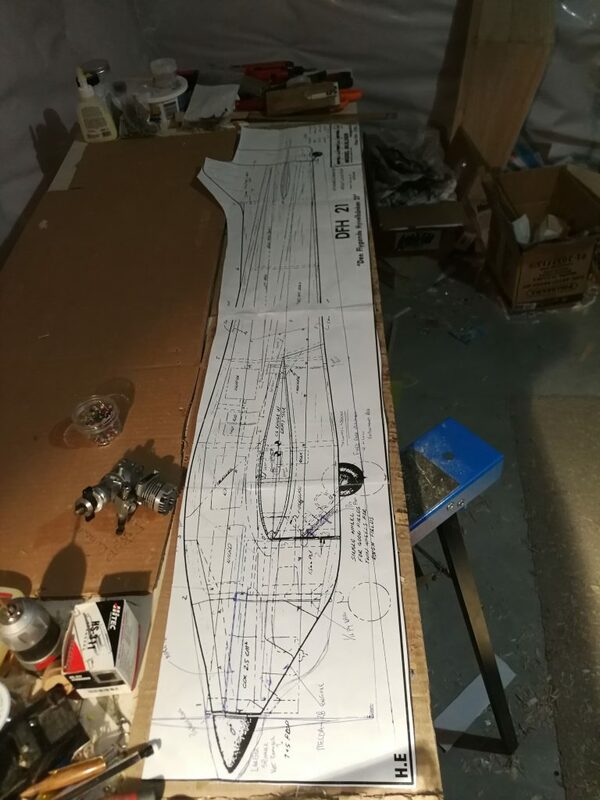 This design had a straight trailing edges and this lent itself to stacked rib construction easily enough. 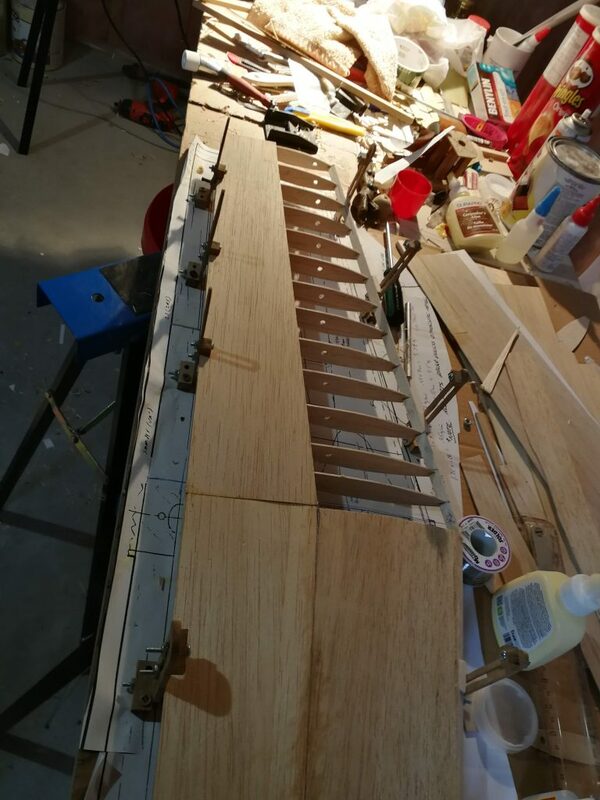 Root and Tip templates were made and then rib material is bolted between. 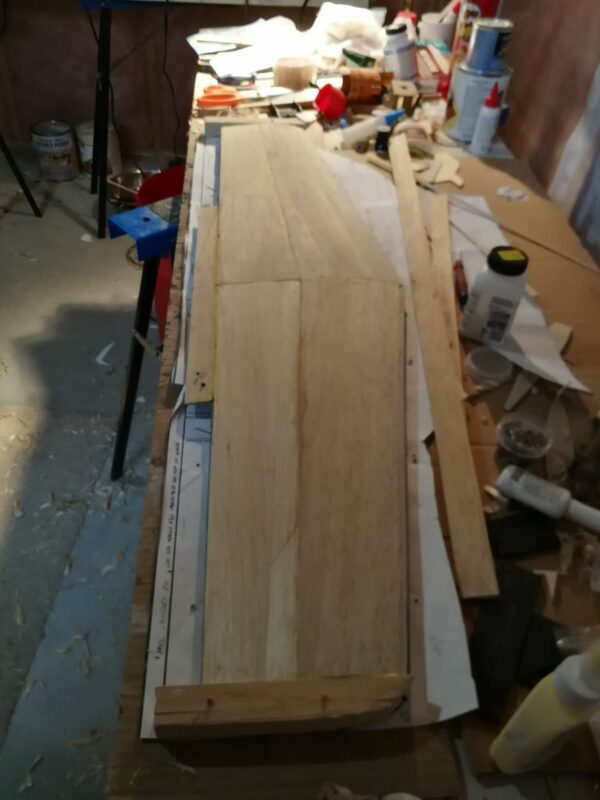 Sanded and carved to shape delivers suitable ribs for half a wing. Procedure is duplicated for the opposite wing half. 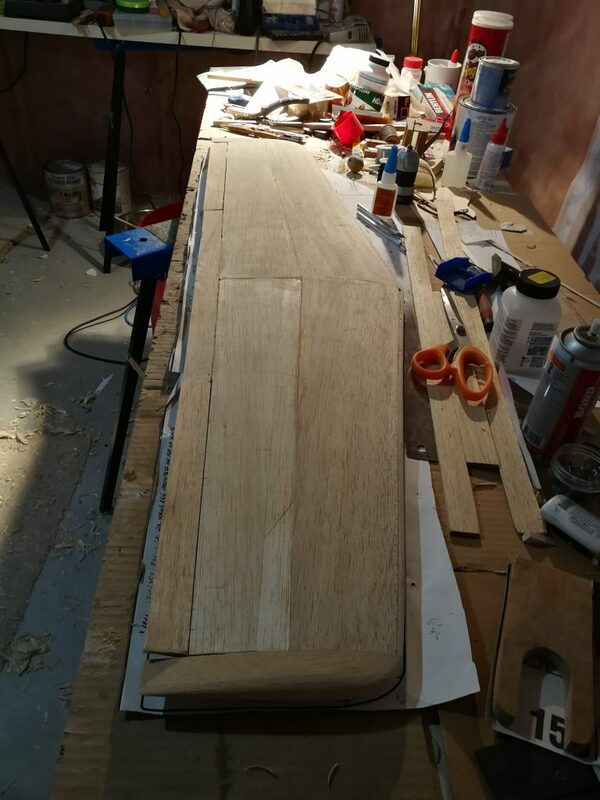 Ribs are left long deliberately and cut to the exact length when installed in place. 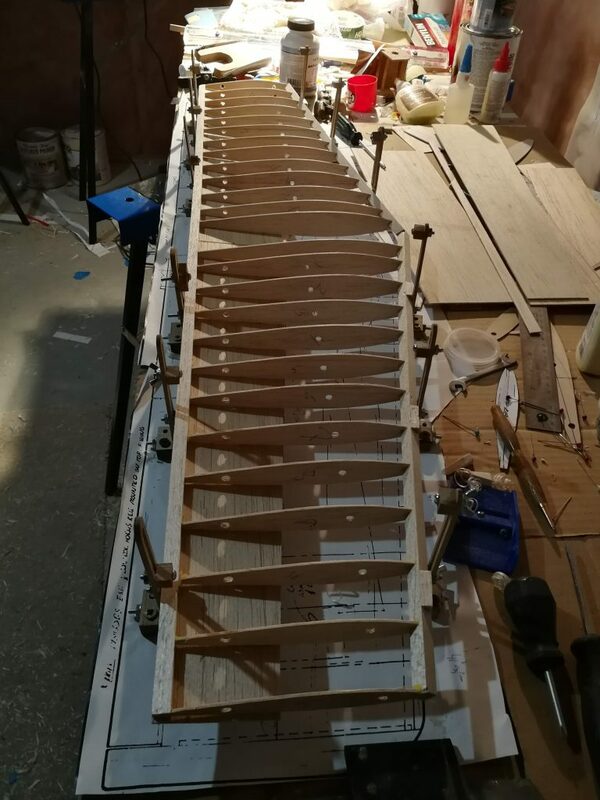 Ribs added one at a time, cut to length and installed, one at a time until completed all ribs. 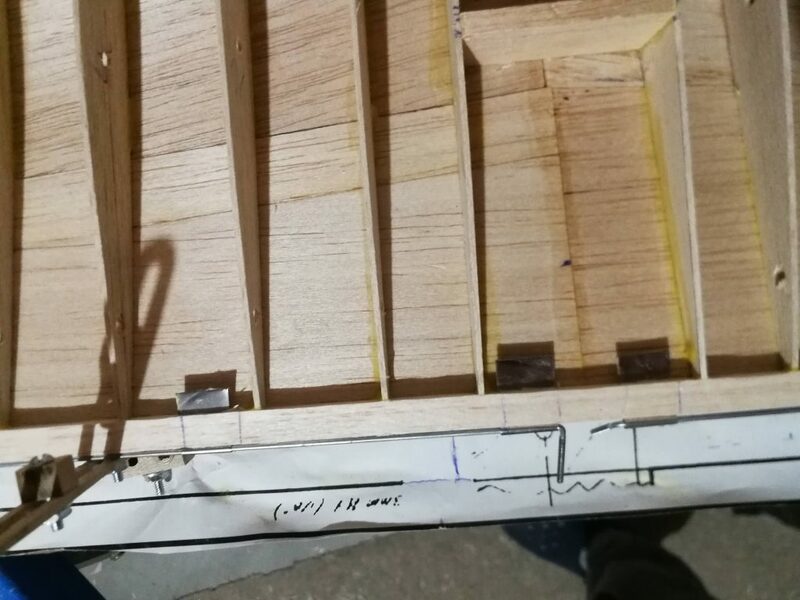 This will make a reasonably rigid structure that can be removed from the jig system and then inspected. 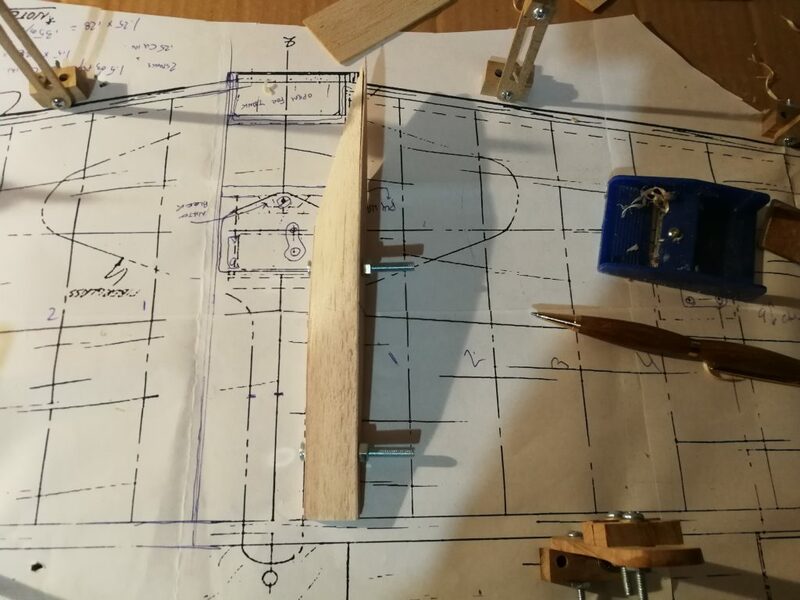 You will find that this makes a straight structure for further construction. 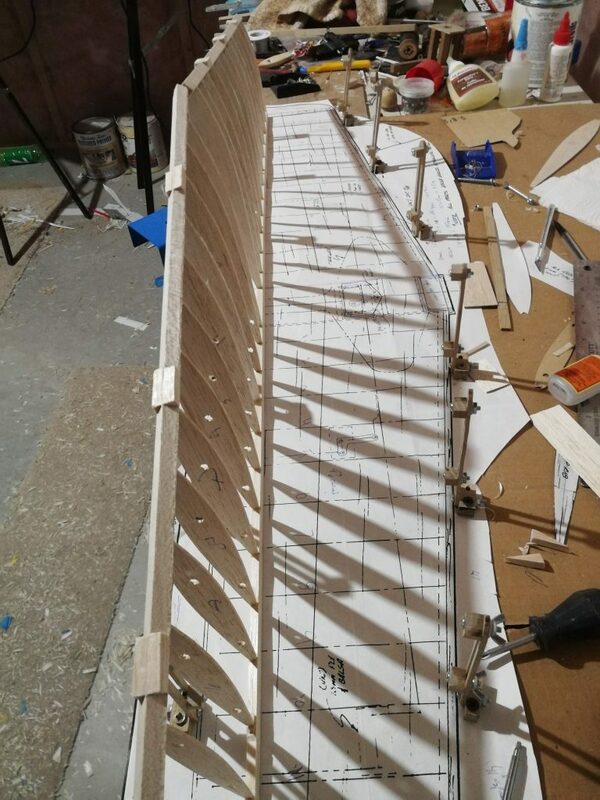 This particular wing is spar less, but could be placed back in the jig and top and bottom main spars added at this stage. 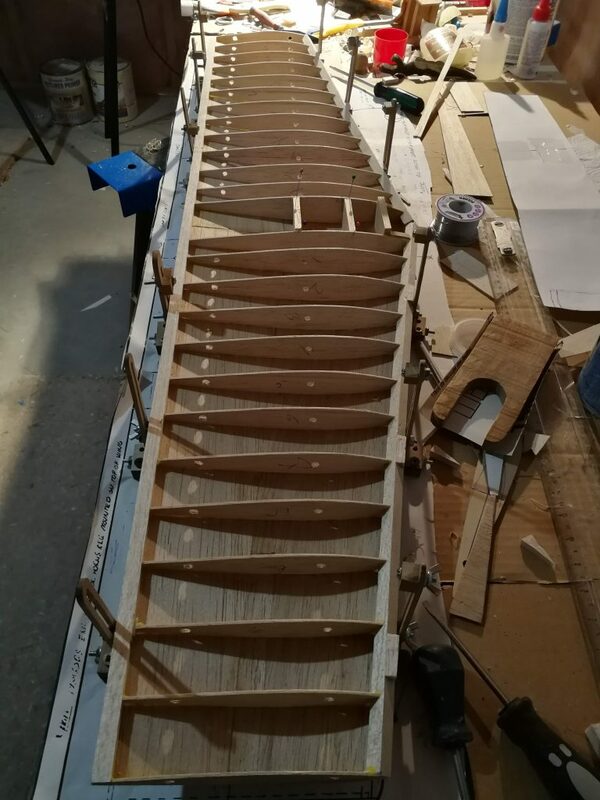 This wing gets sheeted fully and in this case strength is from the fact that the wing sheeting is attached to each rib. 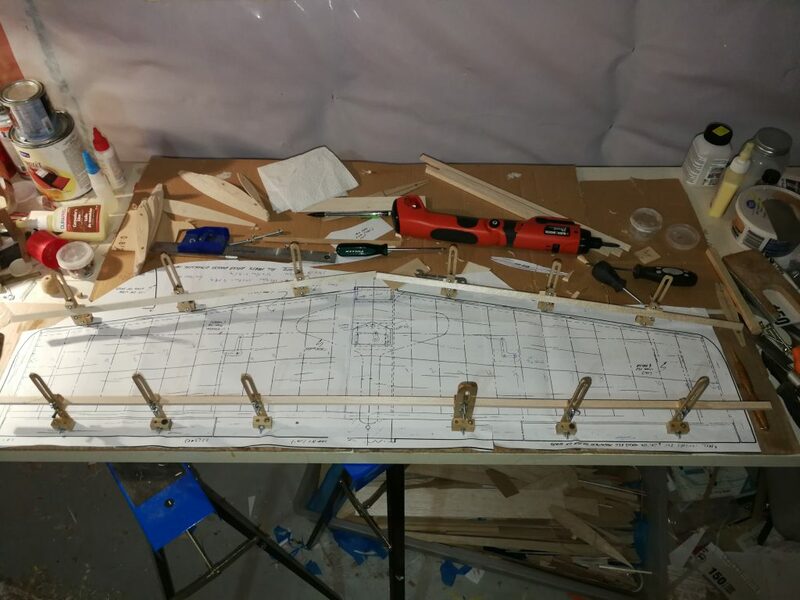 Wing at this stage can be flipped and replaced in the jig for further bottom side construction. 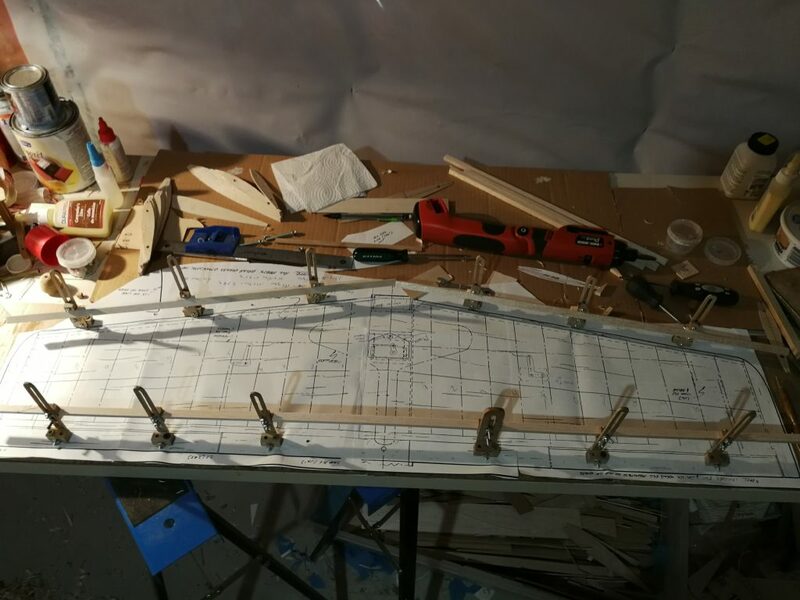 This wing is sheeted top and bottom fully, so each sheet needed to be measured out first. 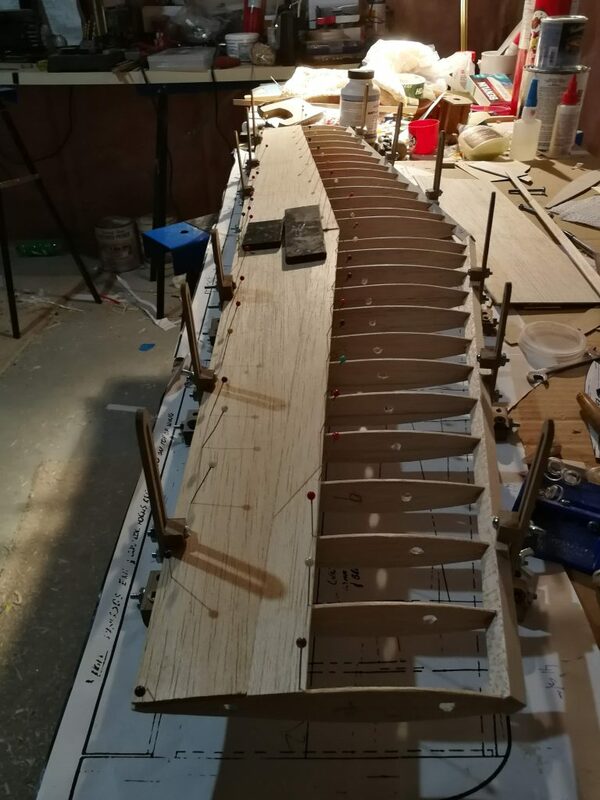 Prior to this step I traced a sheet and cut to size when the wing was out of the jig from the plan and then test fit and glued them on while the wing was in the jig. I did the top side first and then the bottom side. 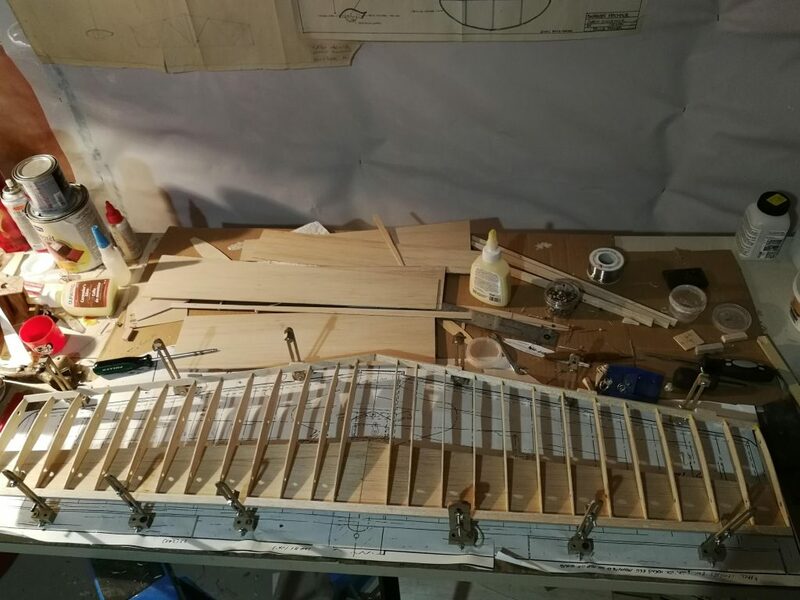 The advantage of the wing remaining in the jig is that the system is strong enough to support the wing while sheeting work is done. Top and bottom are completed in this method. 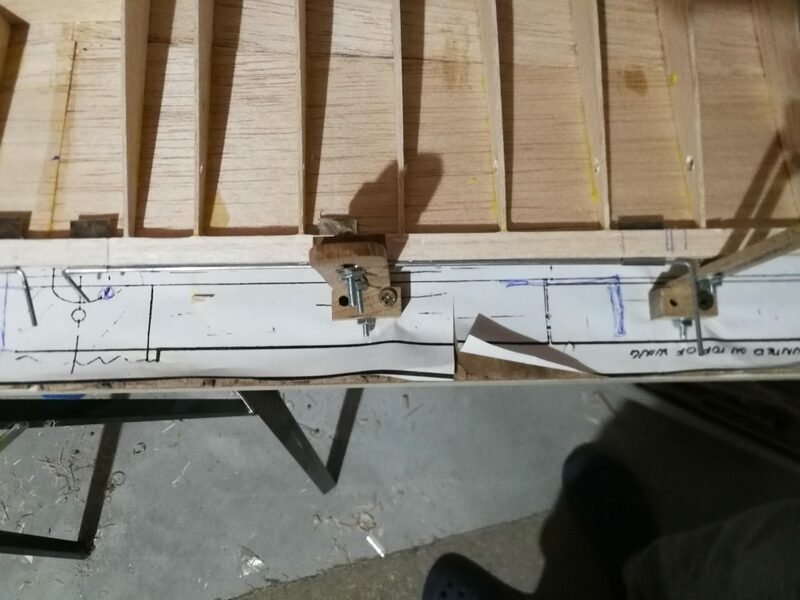 One could have removed the jigs at this stage and completed sheeting on a flat bench but the jig holds things in place well so that weights and pinning of sheeting and parts can be made easily. Bottom sheeting process is the same as top. 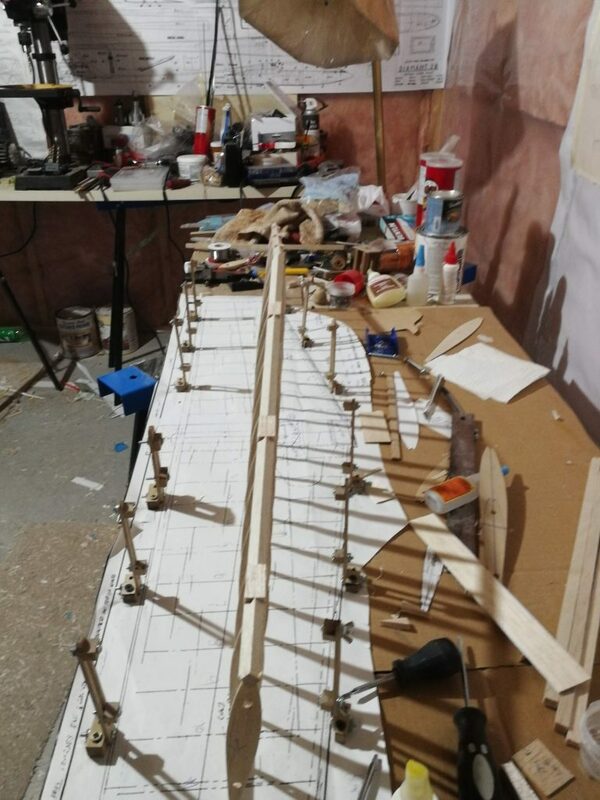 Carpenters glue is used for sheeting as it gave time to work the sheeting in place. 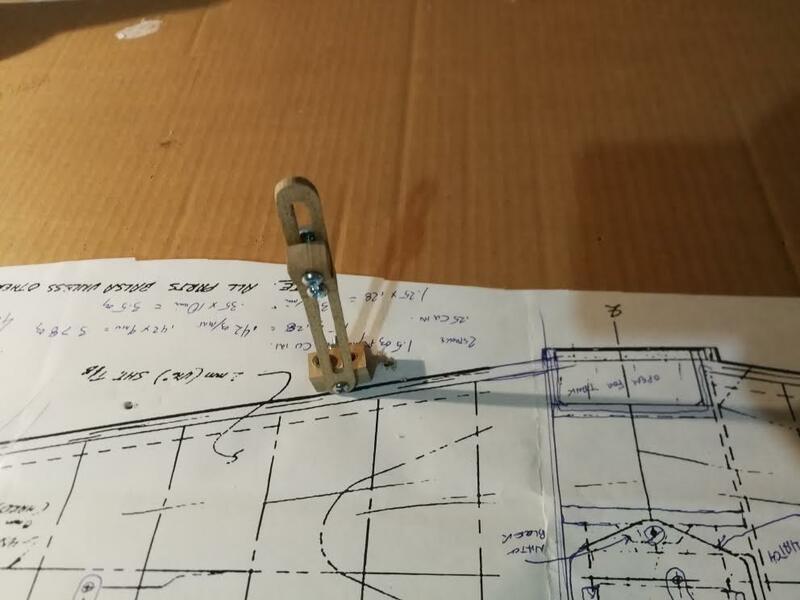 Pins work, even though I am not fond of the use of them. Perhaps slow set CA glue could do. 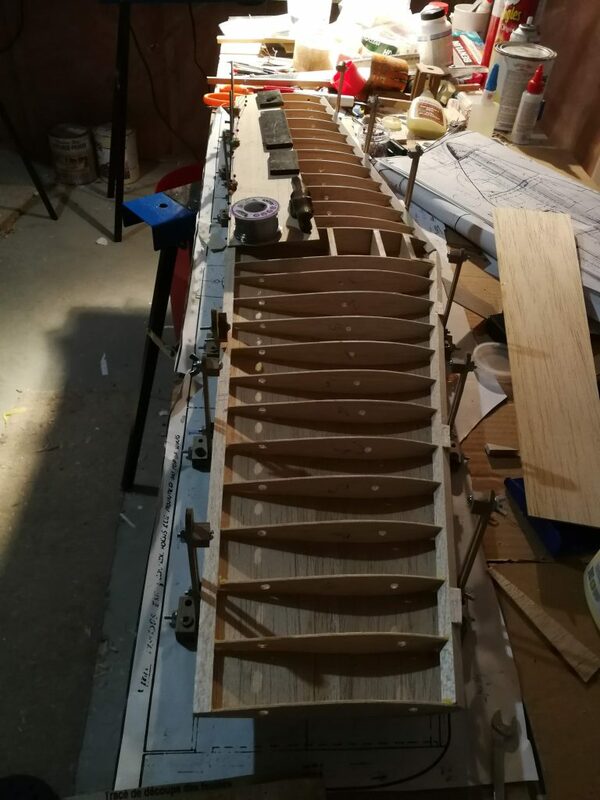 Once sheeting is done, the jigs are removed from the workbench and the wing can now be completed in the usual fashion. 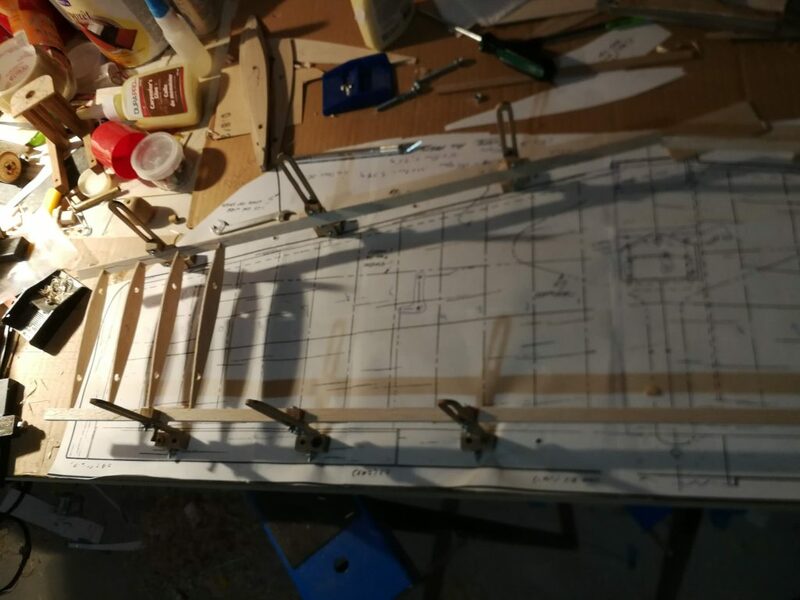 Tips and Ailerons built to requirements. 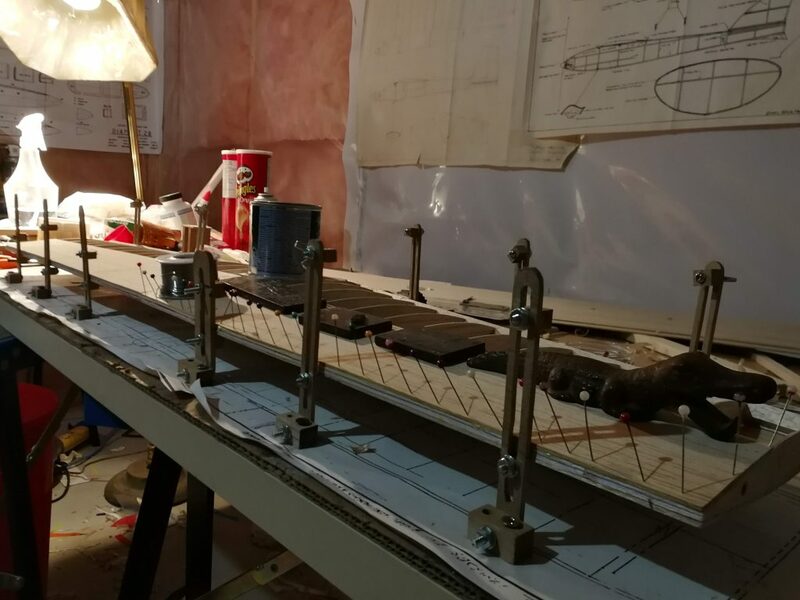 Earlier in the process, the Aileron torque tubes were installed. These are traditional tube and rod type aileron actuators that we normally find for ailerons. 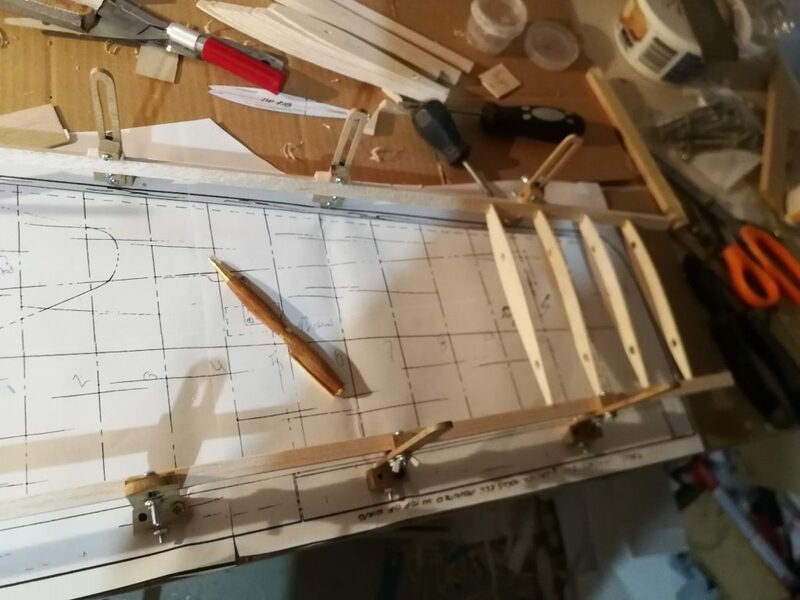 I installed them before the bottom sheeting was in place and I also built the location for the servo and its required tray mounting blocks before the final bottom sheeting. 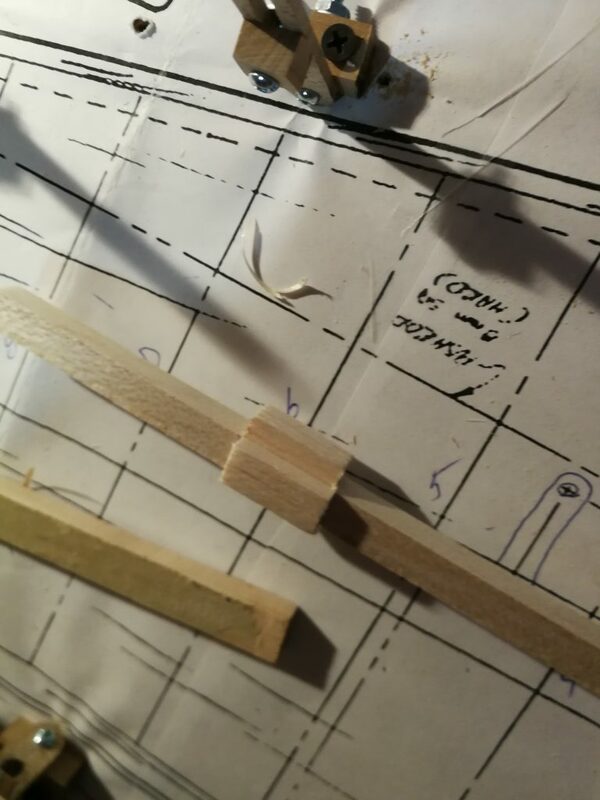 Marked the locations and then cut the hole out for the servo later. 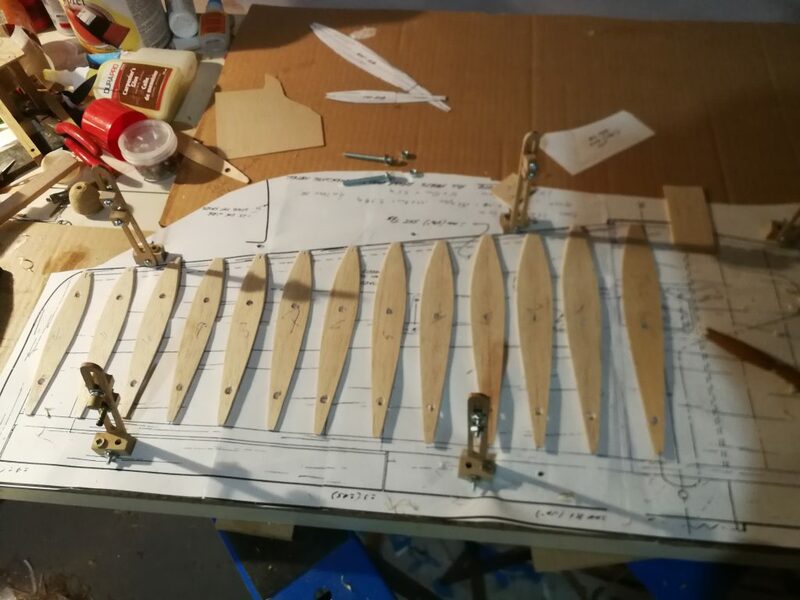 Rough shaped the tips, and made Ailerons and installed them but left them unfastened. 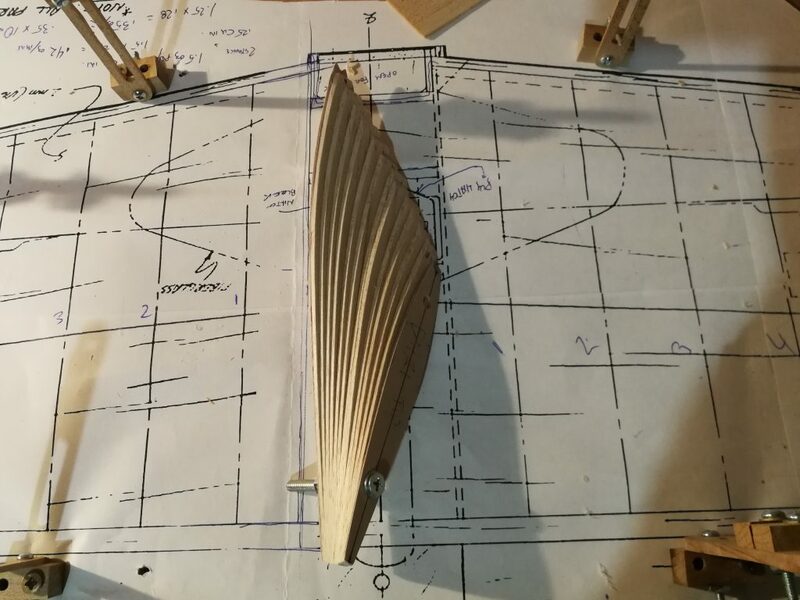 Tips were left Blocked and then the final shape of the wing was made. 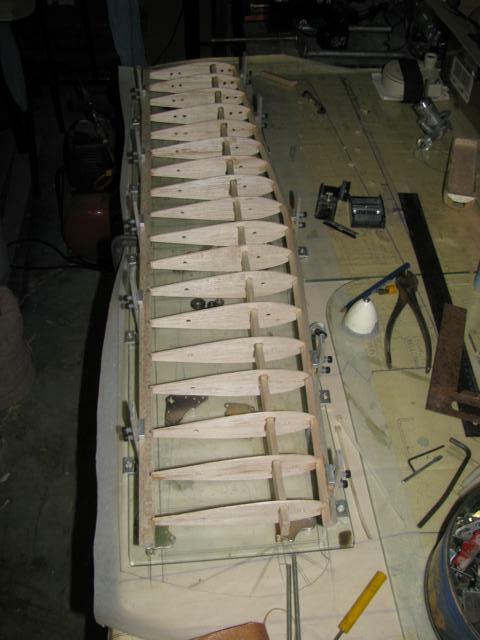 Last image is of a completed wing using the Jig-Its Wing building system. 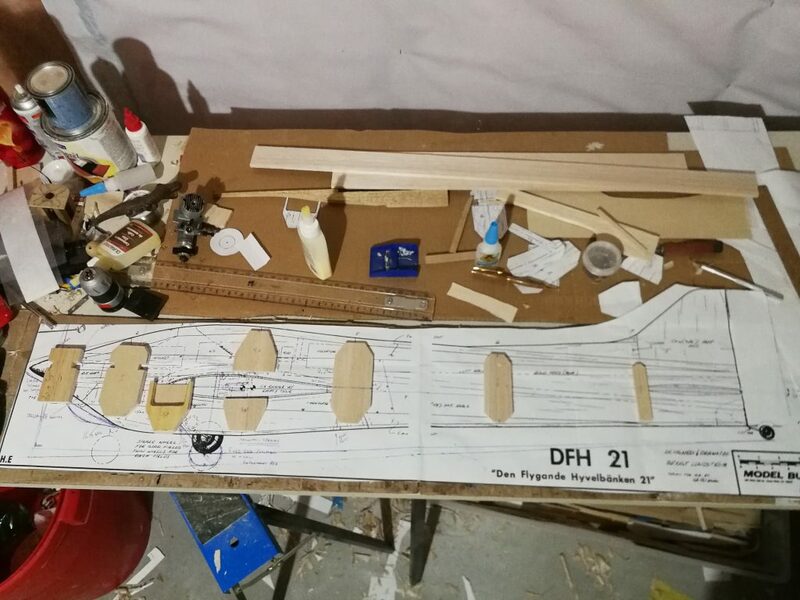 Fuselage construction is next. Build presentation perhaps for another time. Jig-Its in another project from an earlier time. These jig-its were made in aluminum and were mounted on glass on top of the plan. Avia 87 control line Stunt. 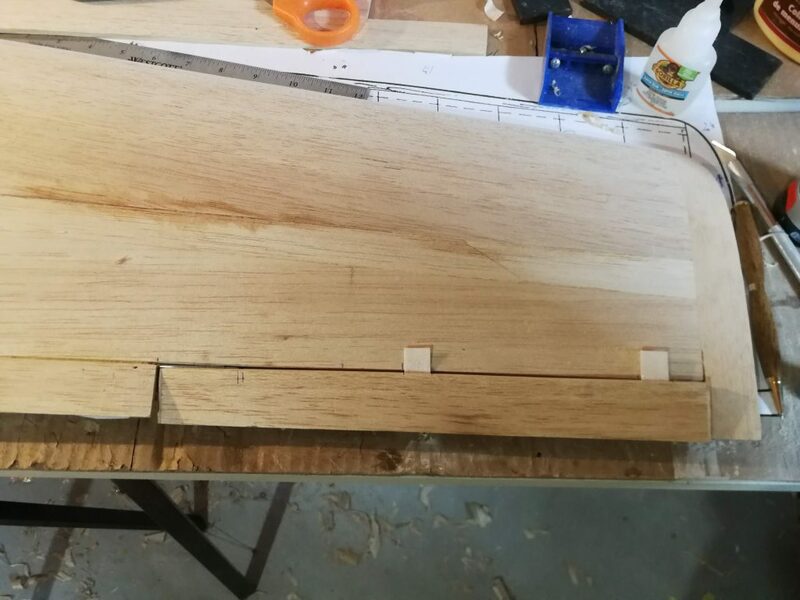 Larger Jig-Its work just as well.